Modern motorhomes are becoming more and more difficult to steal thanks to security devices such as immobilisers, alarms and tracking devices becoming increasingly common, and something which customers are actively looking for. As well as fitting the best security available though, there are some practical steps which you can take to help keep your motorhome safe, and to ensure you’re not one of the unlucky few who has their motorhome stolen. Plus fitting security can earn you insurance discounts for your motorhome. First and foremost it’s important that you choose a safe and secure storage location. If you are storing your motorhome at home then you may want to invest in some locking gates for your driveway (or a drive post) to minimise the risk of theft and earn yourself a better priced quote when your insuring your motorhome. Security lighting may also be a good idea. If you decide to store your motorhome at a storage site then opt for one with good security such as 24 hour access control and monitoring, perimeter fencing and CCTV. Looking at Cassoa approved sites (www.cassoa.co.uk) is a great place to start, especially if you look for those that are ‘Gold Standard’, but remember that sites who aren’t members of Cassoa can be equally good – it’s all about the security systems they have in place. The postcode of your storage location is also a major rating factor, so be sure to check with your insurance company before moving your motorhome to a new location, as they will generally be able to tell you how it will affect your insurance premium. Also make sure that you remove valuable items and consider removing soft furnishings from your motorhome when it is in storage in order to reduce the attractiveness of it to a would-be thief. No doubt you’ll have heard this before, but as long as thefts of this kind keep happening we’ll keep saying it, never leave the keys to your motorhome in the ignition when you are not in the driver’s seat. Even if you have pulled over to the side of the road, such as to check a rear tyre or a brake light you think might not be working, turn off the engine, lock the door, and put the keys in your pocket before walking around the vehicle. It only takes a few seconds for an opportunist thief to jump into the cab and make off with your motorhome, (your insurance will not be valid in this instance) leaving you stranded by the side of the road! 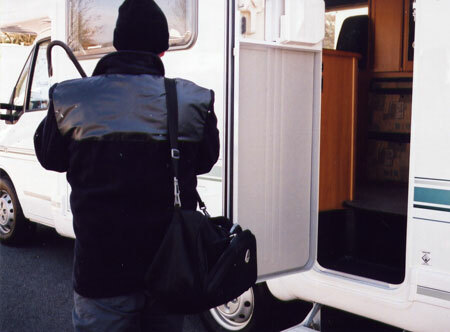 When on a campsite never leave any valuable items such as jewellery, watches or iPods in the motorhome when you go out, and be sure to move removable items such as TV’s, radios, laptops out of view, preferably inside a locked cupboard. Having items such as these on view makes stealing your motorhome a more attractive prospect for thieves. Also see our guide to preventing thefts of items from your motorhome. It’s also a good idea to make friends with your neighbours when on site as they will generally be more than happy to keep an eye on your ‘van while you’re out, as you would do for them, and question any suspicious characters loitering near your motorhome.